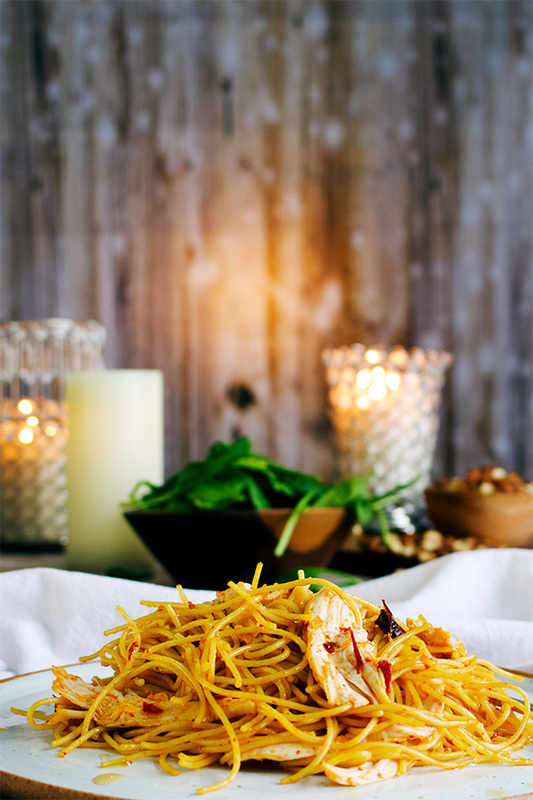 This elegant Garlic Chipotle Pasta with (or without) chicken requires only 7 ingredients and will be on your table in 20 minutes. This is one of those dishes for which I am nearly always prepared to make. Most of us have at least one or two recipes like that in our back pocket, don’t we? Satisfying meals made from ingredients we nearly always have on hand that come together quickly on nights when you really want to eat real food at home but don’t want to spend much time in the kitchen. 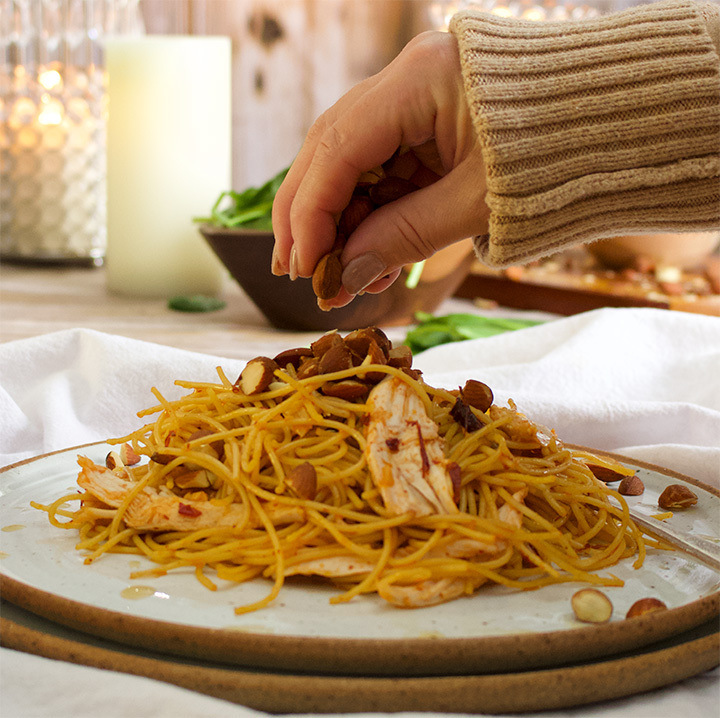 While it’s not in the breakfast category, a favorite in my arsenal of low-effort-but-still-delicious recipes, is this Garlic Chipotle Pasta – with or without the chicken. 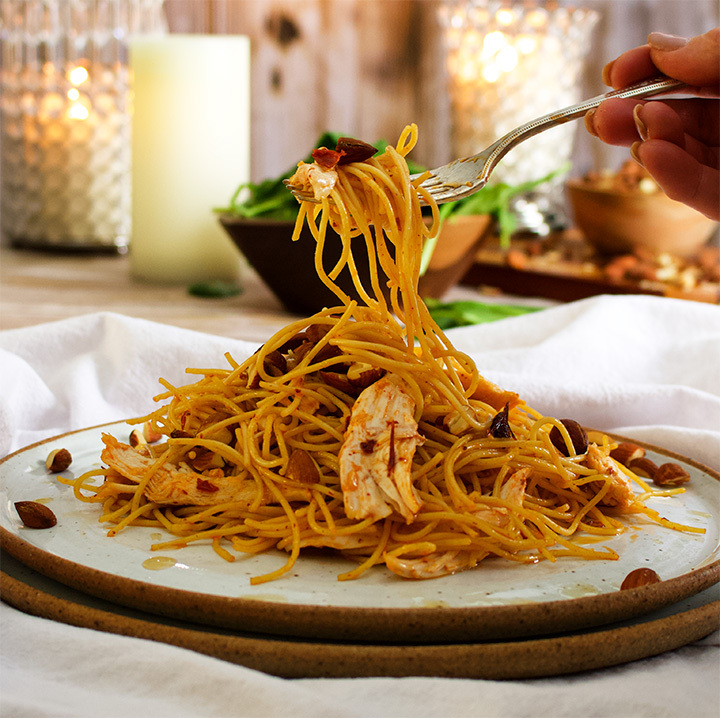 This pasta is appropriately eaten on the good plates by candlelight AND in front of the television in your pajamas. It’s main ingredients are things I almost always have in my pantry and refrigerator: pasta, chipotle peppers in adobo, garlic, olive and sesame oil, almonds, and (sometimes) leftover chicken or sausage. It’s just as good without chicken (or sausage) as it is with it. I haven’t tried it yet, but shrimp would be AMAZING in there. Chipotle peppers are my jam. So is adobo sauce. Roast a chicken, buy a chicken. Leave the chicken out. Simple Roast Chicken is something I make at least twice a month, maybe closer to once a week, and I almost always roast more than one at a time. It takes about 5 minutes to get a chicken or two in the oven and then you have delicious roast chicken to throw into other dishes or eat on its own throughout the week. PLUS – follow this super simple recipe for Slow Cooker Chicken Broth that requires nothing more than chicken bones and water, and you’ll get a whole bunch of chicken broth from bones that you were just going to throw away anyway. I typically throw the chicken bones and water in the slow cooker right after dinner and let it simmer away overnight. In the morning, strain out the bones and put the broth in the refrigerator or freezer. All that to say that I usually have some leftover chicken in my refrigerator. If you do too, throw it in. Or, roast a chicken earlier in the day or earlier in the week. OR – pick up a rotisserie chicken at your local market. OR – leave the chicken out entirely. Honestly, the Garlic Chipotle Pasta is just as good without it. It’s also delicious with some cooked Italian Sausage. And, as mentioned earlier, shrimp might be the best option yet. Make the pasta, buy the pasta. I almost always have at least one box of pasta in the pantry. But making homemade pasta is genuinely one of my favorite things to do on quiet nights when I’m not rushed and can turn on some music, pour a glass of wine, and enjoy the process. There’s nothing difficult about making homemade pasta and I find the process relaxing. Almost meditative. Quiet pasta making nights don’t happen as often as I’d like. Hence, the box of pasta that’s always at the ready. But, when the opportunity arrises, fresh pasta is (in my opinion) always the better choice. 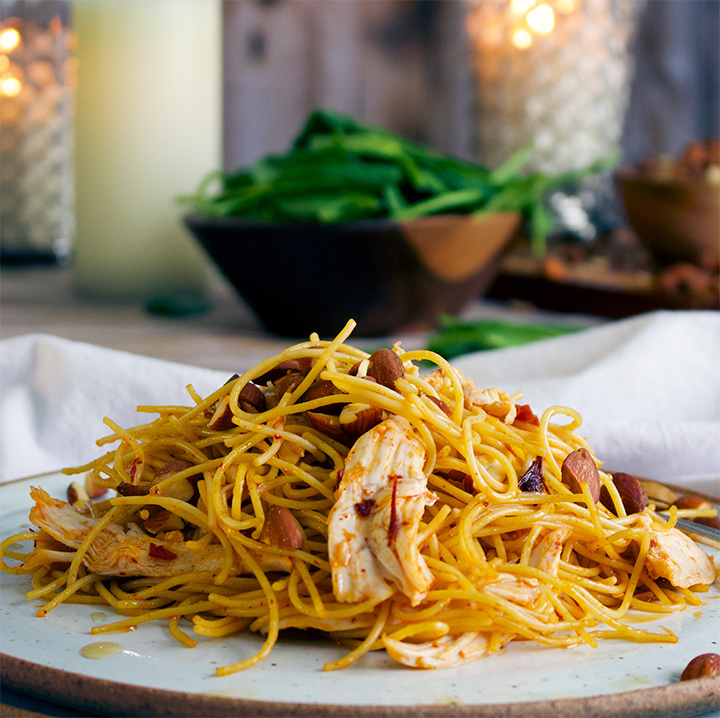 This elegant garlic chipotle pasta with chicken requires only 7 ingredients and will be on your table in 20 minutes. Cook pasta according to package directions. (*Be sure to add at least 1 tablespoon of salt to the boiling water.) If making fresh homemade pasta, follow this step-by-step tutorial. Drain the cooked pasta, toss with 1 tablespoon of olive oil to prevent sticking, and set aside. Pour the remaining 1/8 cup of extra virgin olive oil and the 1/8 cup toasted sesame oil into a bowl or measuring cup. Dump the contents of the can of chipotle peppers in adobo sauce into a fine mesh strainer that’s set over a bowl. Using the back of a spoon, press the peppers so that the sauce drips down into the bowl. Add about 2 tablespoons of adobo sauce to the bowl with the oils. Remove most of the seeds from 2 – 4 of the chipotle peppers, mince the peppers and add to the bowl with the oils. (How many peppers you use depends on how spicy you want your pasta to be.) Add the garlic to the bowl and stir to combine. Set a large saucepan on your stovetop over medium-hight heat. When the pan is hot, dump in the oil and pepper mixture. Cook, stirring constantly for 2 minutes. Add the cooked pasta to the pan. Using tongs, toss the pasta in the pan to coat it in the sauce. Remove the pan from the heat and stir in the shredded chicken. 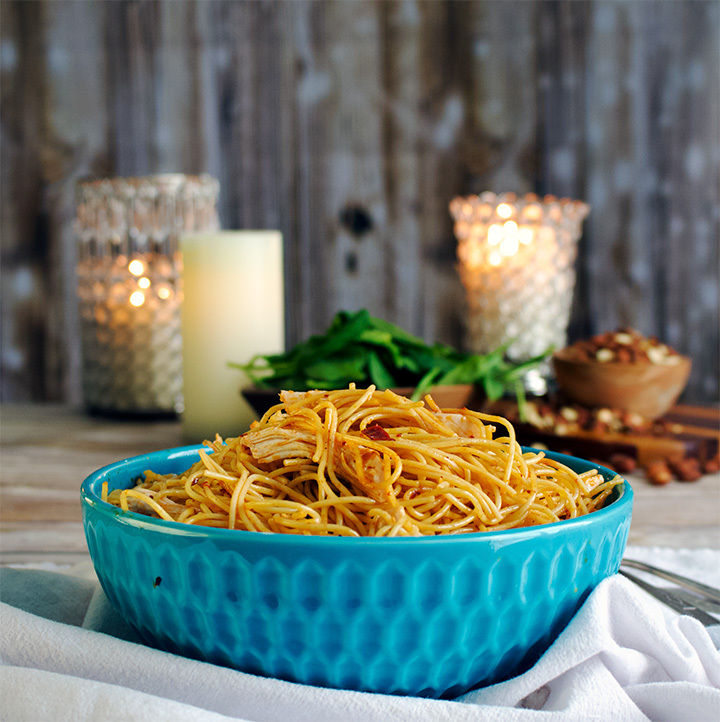 Serve with a drizzle of toasted sesame oil and a sprinkle of chopped almonds. Straining the adobo sauce from chipotle peppers. Whenever possible, I prefer to make fresh homemade pasta instead of using the dried variety. Here’s how to make homemade pasta. It’s look easy, delicious. I will definitely try this for my mother. Thanks for sharing your post. It looks so yummy. Awesome combination of flavors. Love it! Thanks for sharing. Thanks Jack! I hope you make it one of these days – and, if you do, please let me know what you think!